HMRC’s latest statistics provide an insight into the income tax paying population. The figures reveal changes in the distribution of tax revenue over the last decade, with a growing share now coming from higher earners. The pie chart shows the proportion of 2018/19 tax expected to be paid by taxpayers in various bands of income. For example, the smallest wedge shows that the bottom 50% of income tax payers (those with annual income of up to £25,500) will provide 9.5% of all income tax receipts. At the opposite end of the scale, the largest wedge is the top 1% (with incomes of at least £177,000) who will supply 27.9% of the £185 billion of income tax the Treasury hopes to receive for the current tax year. 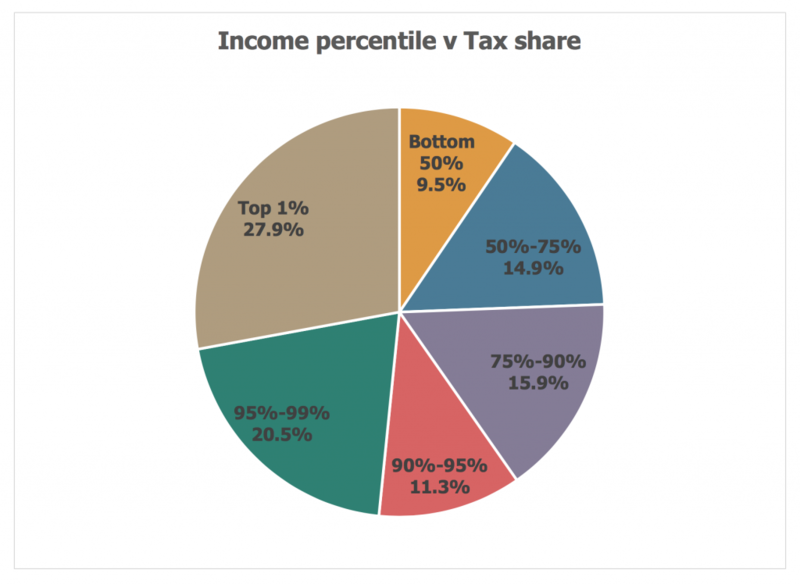 In other words, over a quarter of income tax comes from ‘the 1%’. The Exchequer’s dependence on a small group of wealthy taxpayers is nothing new. However, the concentration has grown since the start of the decade. For example, in 2010/11 – when additional rate tax first appeared at the 50% rate – the contribution from the top 1% was 25.0%. For the top 10% of taxpayers (with income of at least £57,500 in 2018/19), the tax share has risen from 53.5% in 2010/11 to 59.7% this tax year. Over the same period the bottom 50% have seen their share drop from 11.3% to 9.5%. There are many reasons for the squeeze on high income groups. For example, the political imperative of above-inflation rises in the personal allowance has kept taxpayer numbers flat, which means more revenue must be extracted from a static taxpaying population suffering low earnings growth. Keeping a tight rein on the higher rate threshold and freezing the additional rate threshold at £150,000 have both added to the concentration on higher earners. With the Chancellor dependent on high income taxpayers, he cannot afford to cut their taxes – hence the freezing of both the additional rate threshold and the £100,000 starting point for the taper of the personal allowance. The added pressure on high earners is expected to continue so if you want professional help to review your personal tax situation, contact our team on 01202 875 900.